Housing Developments: Debate night party at your place? 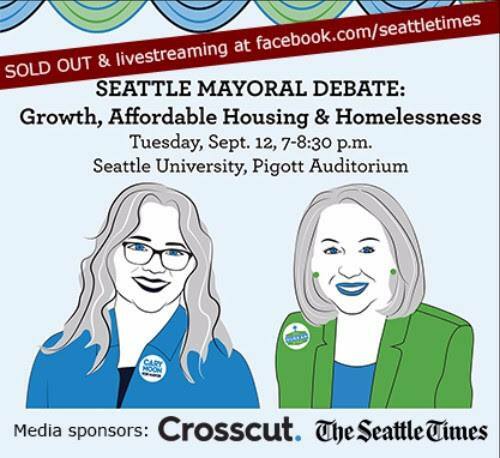 Seattle Mayoral candidates Jenny Durkan and Cary Moon will debate growth, affordable housing, and homelessness tomorrow, Sept 12th, at 7 pm. The sold-out forum will be live-streamed by the Seattle Times and moderated by Enrique Cerna of KCTS with reporters Heidi Groover of The Stranger, David Kroman of Crosscut, and Vernal Coleman the Seattle Times. Join our partners at Firesteel for a pre-debate show at 6:30 pm, livestreamed from their Facebook page. HDC is proud to partner with SKCCH and WLIHA Action Fund to support the forum’s hosts Solid Ground and the Seattle U Project on Family Homelessness. Public hearing double header tonight: Seattle City Council will hear public comment on the MHA-triggering uptown rezone AND improvements to the city’s design review process. The City of Auburn partnered with Valley Cities and the Auburn Food Bank to open a new shelter for people experiencing homelessness. UW and the Seattle Housing Authority announced plans to build 150 affordable homes in the university district designed for employees. Might Amazon’s decision to seek a second headquarters let some of the air out of the region’s housing bubble? Shelter, but not housing: Lack of affordable housing is keeping people swept from tent encampments from exiting homelessness. At-large Seattle City Council candidates Jon Grant and Teresa Mosqueda will debate Thursday. Early bird registration is open for our first ever Advocacy Intensive! This two-day training will build your capacity for systems change work by helping you understand mobilization and organizing, housing policy and the political process, and how to engage with electeds. Save $30 on registration now through September 18th.